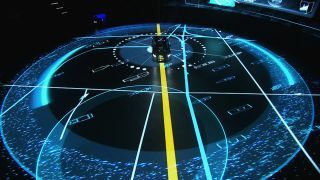 When prestige car maker Audi introduced its revolutionary A8L luxury saloon to the Chinese market, technical service company Redline turned to the BlackTrax real-time motion tracking system to help deliver the “Wow!” factor to the launch show. Each of the cars featured in the show was fitted with ‘BTBeacons’ which transmitted the exact position of the vehicles as they moved around the stage to ‘BTCams’, which then relayed the information to the lighting console so that any lighting look could be designed while automatically following the cars on the stage, regardless of speed or direction, with an accuracy that would not have been possible to achieve manually. Another big part of the reveal, was the futuristic graphics projected on the floor and not only accented the beautiful car, it also helped explain some of the A8L’s new built in technology and features. The mapped projection interacted with the car as it drove around the stage. As well as the BlackTrax system, the Audi A8L launch show featured no fewer than 30 Panasonic PT-SRZ31KC projectors, 72 Acme lighting features – being used by Redline for the first time – two gx 2 and four 4x4pro media servers from disguise and motion graphics from Notch.